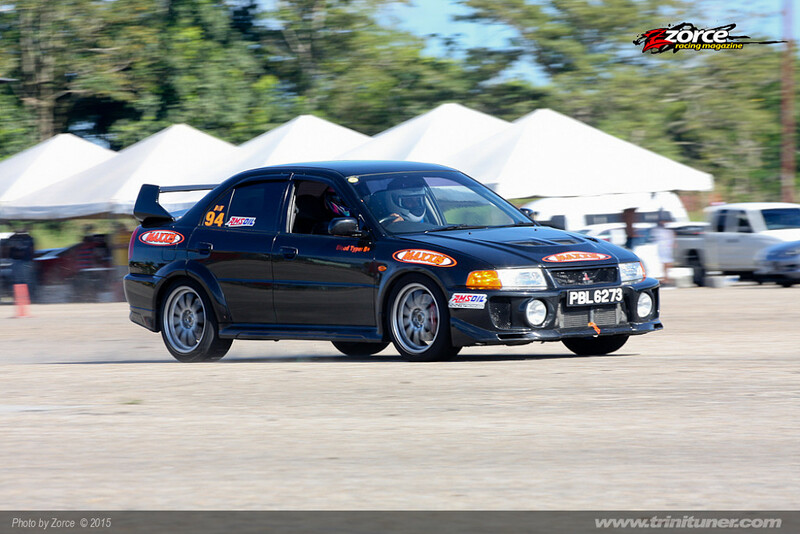 CARS kicked off its first competition event for 2015 on March 8th at the Arima Race Club car park with the kind assistance of sponsor TriniTuner.com. Head of Autocross, Trevor Van Sluytman, opted for a twist to the familiar old karting course. This time the course was run in reverse in an attempt to level the playing field for the rookies now entering the heat of competition. They had an excellent opportunity to observe their lap times and further hone their newly acquired skills, especially under mixed track conditions with varying grip levels. Given that the course would have been more familiar to the veteran drivers, any embarassing errors would come at the expense of their pride and bragging rights. This year, we’ve seen some of the seasoned competitors taking bumps into higher classes, which has heightened the already stiff competition. Alistair Rahamut, an experienced competitor in his Mitsubishi Lancer Evolution 5 took the fastest time of the day and first place in the Open class with a blistering run of 43.981 seconds. The second-fastest time of the day and second place in OPEN went to Amir Hosein in his Evo 6 with 44.508 seconds, roughly half-second behind Alistair. Surprisingly, the Open class turned out to be the largest class that day with eight strong competitors vying for top position. Also at the top of their respective classes were Olatunji Rudder in EP with a Subaru TS/WRX followed closely by Akash Maharaj driving the RB7 and still getting accustomed to a newly installed LSD, brand new (as opposed to foreign used) rubber and oddly, less power. Once more, this pair was separated by a small half-second margin– a narrower gap than ever and a virtual delicacy for the 2WD drivers who relish the idea of chasing 4WD times. 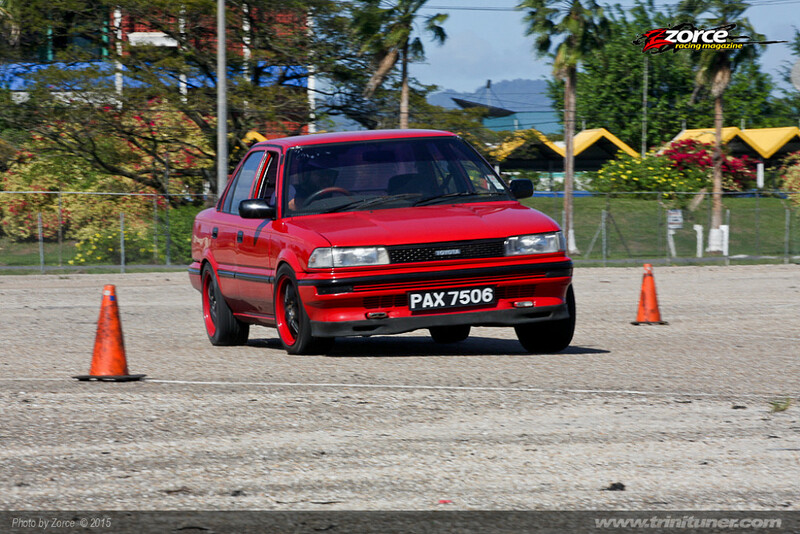 Christopher Ragobar won 1st place in SS with his RB-powered Nissan Cefiro narrowly beating Dwayne Caberrea in his Suzuki Swift Sport by 0.3 seconds, showing that the seemingly mismatched cars were equal when the many corners and shorts straights were tallied. This particular battle was also one of kerb weights– heavy FR (front-engined, rear wheel drive) vs lightweight FF (front-engined, front wheel drive). In this case the Cerifo’s power was controllable enough, thanks to newly installed coilover suspension and meaty rear tyres, to eke out a class-winning 47.015-second run. The ESP class saw the FF battle of the 4AGE Toyota Corollas as Ramon Rabathaly was barely a half-second ahead of rookie driver Anton Wei Lung Chung who was driving very well in his first competition event. Some say this one was ketchup vs. mustard. Adrian Persad again proved that the often-overlooked VTEC-less Hondas can be one of the best machines for autocross, posting a 47.614-second run as he was pressured by Kristopher Lucky who was nipping at his heels in a showroom-spec Kia Cerato. Persad led ES by a fairly comfortable 0.7-second margin, while Lucky was less than 0.3 ahead of veteran driver Gary Bennett, in the same Kia. Special mention must be made of the first 2014 Ford Fiesta seen in competition at the hands of Adesh Ramdeen, who seemed to familiarising himself with the car and posted a respectable 49.065-second run to take 4th. Will more pace be found for the Fiesta? Only time will tell. HS Class omitted from article. wagonrunner wrote: HS Class omitted from article. I guess HS class could boycott the next event, since we are not worthy of at least a mention in an event article! María wrote: I guess HS class could boycott the next event, since we are not worthy of at least a mention in an event article! Or you can just run in the more competitive ES class. Why not have everyone in open then? If cars in a constituted class should be absorbed by another. How was HS constituted when 2/3 of its cars are ES cars? ^^ 1/3 padna. My P11 and Kevin's B13 were registered for HS after dyno day, take it down a notch man. CS3 lancer decided to enter HS for a competition to be worthwhile. Kathy has great character she isnt about winning the competition. idlemind wrote: How was HS constituted when 2/3 of its cars are ES cars? Cars classed in HS competed in ES because there was no other HS at the time, and this causes the cars to get reclassed to ES? wow. I recommend you reread the sections dealing with classification. Last edited by wagonrunner on March 20th, 2015, 5:48 pm, edited 1 time in total. I didnt say you couldn't compete HS.....your Dyno sheet did! You do understand a driver can choose to run in a class ABOVE but not in one below right? OBVIOUSLY If one of the HS cars was classed as ES it would HAVE To run in ES or above! I know the rules guys. Just find it interesting that Cathy's CS is classed in HS. What were your figures? I think I remembered your whp was 90+, not so? And my CS was a whopping 2727lbs. idlemind wrote: I know the rules guys. I'm confused why there is all this agitation here.. this was the result of the dyno day and posted in advance of the event. No. I'm not paying for public knowledge. What is your power/weight Cathy? Pete, I don't think that link is working, if the results from dyno day are available, they should be posted here just to make things crystal clear amongst competitors. In the thread about who the competitors that are in the championship Maria's car is shown in hs and the KIA in es. This list was done by the executive with the results from the dyno day. My car shows up in ss as my pwr was 13.5 and I only have 3 penalty points so I think it's correct. they should probably just post, the results of each competitor dyno results so that everyone is in on the loop or atleast email it to everyone. Anyone else want to post their results? Ya forgot the 15% to convert to bhp. Not that here is the place but since we are all weighing in..
here is the official forum for CARS Autocross matters, updates, discussions, results, event announcements and anything else that tickles the fancy of its membership and those interested in the club or becoming members. that was voted upon at the last AGM and weirdly agreed to, since updates and activity is very rare here.